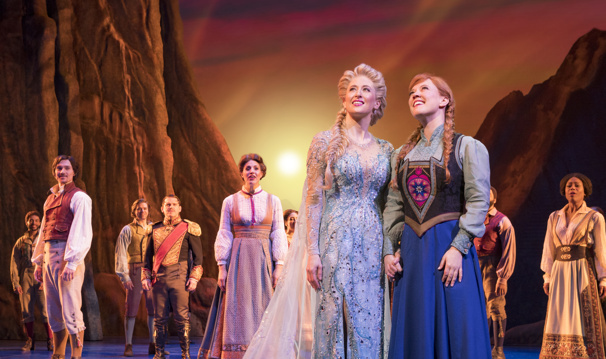 Caissie Levy & Patti Murin with the cast of Broadway's "Frozen"
Disney has also announced a production of Frozen at the Capitol Theatre in Sydney, Australia opening in July 2020, as well as a new mounting in Hamburg, Germany in 2021, with further details to come. Adapted by the film's screenwriter and co-director Jennifer Lee and featuring a score by the film's Oscar-winning music makers Kristen Anderson-Lopez and Robert Lopez, Frozen centers on two sisters who are pulled apart by a mysterious secret. As one of them, Elsa, struggles to find her voice and harness her powers within, the other, Anna, embarks on an epic adventure to bring her family together once and for all. The Broadway premiere of Frozen began previews at Broadway's St. James Theatre on February 22, 2018 and opened on March 22, where it continues to play. The production is directed by Michael Grandage and choreographed by Rob Ashford, with musical supervision/arrangements by Stephen Oremus. Broadway's Frozen currently stars Caissie Levy as Elsa and Patti Murin as Anna, with Noah J. Ricketts as Kristoff, Ryann Redmond as Olaf and Joe Carroll as Hans. Casting for the international stagings will be announced soon.